FALSE Mildew is powdery or downy white, yellow, or brown-colored fungus that grows in a flat pattern on surfaces and can be scrubbed off easily with a spray cleaner and brush. Mold is a fuzzy, aggressively growing fungus that creates difficult-to- kill spore clusters that behave like roots and grow deep into porous surfaces such as drywall, tile grout, and wood. Mold can be blue, green, yellow, brown, gray, black, or white. In bathrooms, mold roots can travel all the way through grout, behind tiles, and into walls and house framing. Mold consumes and destroys surfaces and, depending on the variety, may also cause health problems, including sinus infections, headaches, allergies, inflamed respiratory airways, and more. FALSE Bleach only kills mold and mildew on tops of surfaces. The chemical structure of bleach disallows its absorption into porous surfaces, no matter how much you apply, even when undiluted. The surface top may look clean and white, but just a few millimeters underneath the mold is still alive and will start re-growing within minutes. FALSE Bleach requires a full five-minute soak time with at least three-quarters of a cup of bleach per gallon of water to kill surface mold spores. The problem is that bleach makes mold look white before it dies, so people often rinse bleach away before it has killed any mold at all. Worse yet, the water in your bleach solution soaks into porous surfaces and feeds the deep mold you are trying to kill. Unchecked, the mold grows deeper into walls and studs until structural damage and health impacts become so bad the problem can no longer be ignored. FALSE This is a dangerous half truth and a big reason why so many home owners let mold damage get out of control in their bathrooms. 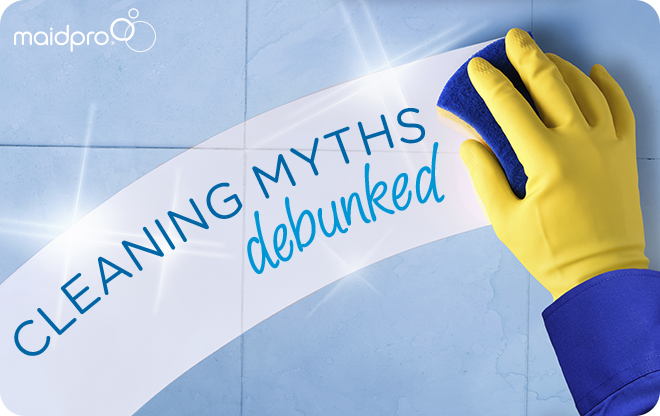 There is a simple test: if you can scrub stains off easily with a bleach-free bathroom cleaner, it’s probably just mildew. If you use a bleach-based cleaner and the stains return after a few days in roughly the same spots, you’ve likely got mold growing beneath the surface. FALSE This is, by far, the falsest claim of all. It is impossible to keep new mold spores from entering your home as it can grow anywhere it finds food—decaying matter such as fallen leaves, garbage, or trash—and moisture—which can be anything from leaky pipes to air humidity—in temperatures ranging from 32-120°F. Even mold on food in your freezer doesn’t die; it merely goes dormant until it warms up! If you can survive in an environment, so too can mold. What is more, there are varieties of mold spores that are just as toxic and allergy-inducing when dead as when they are alive and growing. FALSE The only way to truly solve a mold problem is by removing infected materials and the sources of moisture that started the problem. Controlling indoor air humidity, repairing leaky pipes and shower walls, resealing and replacing porous grout, caulking, and more are all parts of the solution. Most mold sprays are simply fancy-marketed bleach sprays that remove mold stains, but do nothing to address root problems. As a rule of thumb, if you have a mold-affected area larger than 10 square feet, immediately seek the help of a professional mold-abatement service.